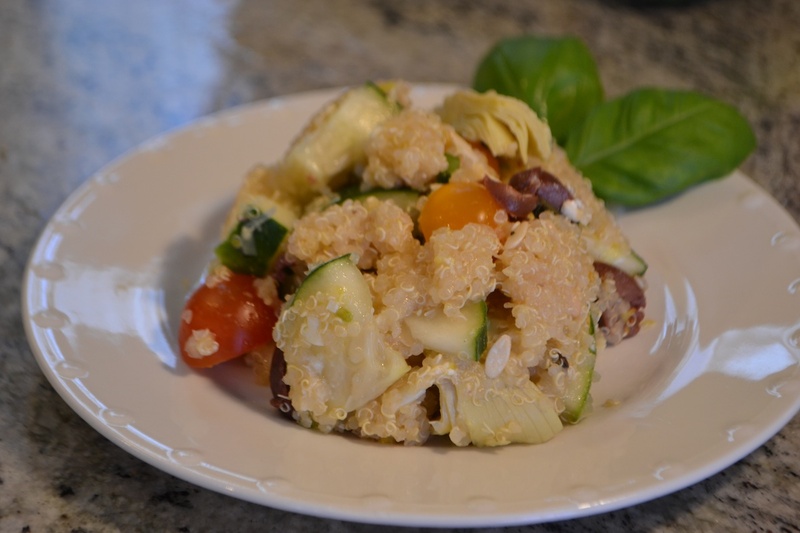 It is time for a great grain recipe that helps clear out the fresh veggies from your garden. It can take as little as 20 minutes to make or more if you use a variety of grains in your recipe. Check out the previous blogs on the protein content of the grains and the nutrients they provide. Let me know which grains you use and the results!!! Cook the grain according to package directions. See bottom of recipe for basic directions. Prepare the remaining ingredients while the grain is cooking. Combine cucumbers, tomatoes, feta, artichoke hearts, pine nuts, olives, lemon juice, lemon zest and basil in a large bowl and lightly toss. After the grain is cooked, remove from heat, fluff and wait for it to cool for about 15 minutes. Add to the prepared mixture and gently toss. Drizzle the oil and crack fresh ground pepper and gently toss one last time. Barley: 1 1/4 c water for 1/2-cup barley. Boil water, add barley. Simmer for 45 min on low heat. Couscous: 5/8 c water for 1/2 c couscous. Boil water, add couscous. Stir, cover and remove from heat. Let stand for 5 minutes. All of them about double in size when cooked.